Ten political parties claiming to uphold the political legacy of martyred Burkina Faso Marxist and Pan-Africanist revolutionary Thomas Sankara formed an alliance last week. The unity agreement came several months after a national uprising which ousted former coup leader turned president, Blaise Compaore, who is now living in exile in neighboring Ivory Coast. Compaore was forced to flee after a people’s rebellion in late Oct. and early Nov. when hundreds of thousands of youth and workers took to the streets demanding that he not stand for another term. When it appeared that the parliament would allow Compaore to run again, the building was attacked, occupied and set on fire. Continuing unrest prompted two military coups over the following days with many protesters demanding the immediate return to civilian rule. A coalition of military and political leaders established an interim government mandated to hold elections on Oct. 11, 2015. Between the years of 1983-1987, Sankara led a revolutionary movement which took power and sought to transform the post-colonial agricultural state into a source for the improvement of the living conditions of the people and as a model for other nations in Africa. Sankara, known as the “Che Guevara of Africa” was assassinated along with twelve other military and political officials in a counter-revolutionary coup led by Compaore, who remained in power for over 27 years. His policies drew the ire of neighboring Ivory Coast, a close ally of France, which has always been suspected of playing a role in the coup that removed Sankara from power. After the removal of Sankara in Oct. 1987, the country reverted back to being an outpost of French and United States imperialist intrigue. During the tenure of Compaore, Burkina Faso became leading producer of gold on the African continent. Under Compaore, the neo-colonial state served as a base for French military intervention in neighboring Mali. Paris is a close ally of Washington’s so-called “war on terrorism” carried out on the continent by the U.S. Africa Command (AFRICOM). The widow of Capt. Sankara, Mariam, who often speaks out on various aspects of Burnikabe politics, urged the parties to come together in order to challenge the neo-colonial backed forces in the upcoming elections. A candidate, Me Benewende Stanislas Sankara was recently endorsed by the ten political parties claiming to be heirs of the ideology of Burkina Faso’s martyred leader. Me Sankara, an attorney, is involved in demanding that an inquiry be conducted into the Oct. 1987 coup and assassinations. Me Sankara, who is of no family relations to the former revolutionary leader, was one of the lawyers representing the family of Thomas Sankara who was assassinated in a coup in 1987. After a judicial order in March by the Burkinabe courts, a grave said to contain the remains Thomas Sankara and other leaders killed on that fateful day in 1987, was exhumed on May 25. This is the first phase in the efforts to determine if in fact Sankara was buried at this location and what were the real causes of his and the others’ deaths. Sankara’s sons Philippe and Auguste are providing DNA samples which experts can utilize to confirm if the remains in the tomb are those of the martyred leader. The process of providing positive identification could take several weeks. Meanwhile, a political biography of Sankara was released late last year chronicling his development, rise to power and subsequent assassination. The book entitled, “Thomas Sankara, An African Revolutionary”, was written by Ernest Harsch, a long time researcher and analyst on African affairs. This book comes at a time when there is mass discontent emanating from youth and workers throughout various regions of Africa. 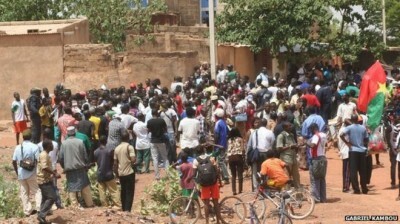 The uprising in Burkina Faso was not an isolated incident but was reflective of the failure of the neo-colonial African nation-states to address the fundamental needs and aspirations of the majority of people within society. Sankara sought to rapidly advance the development of Africa by breaking ties with imperialism which continue to hamper the forward progress of the continent. Over the last seven years since the formal founding of AFRICOM, the Pentagon and the Central Intelligence Agency (CIA) has escalated its interventions in Africa. As a result of this deeper military and intelligence penetration of the continent, the capacity of African states to resolve their own national security imperatives have been severely weakened. Events in Mali, Burundi, the eastern Democratic Republic of Congo, the Republic of South Sudan, Somalia and other states demonstrate that absent of unity and self-determination there can be no genuine sovereignty for the formerly colonized nations. To organize the people of Africa on an anti-imperialist basis there has to be an ideological reorientation towards socialism to restructure society in the interests of the workers, farmers and youth. Harsch’s book chronicles Sankara’s journey from his youth extending to his recruitment into the military, rising political consciousness, and burgeoning anger with the-then Upper Volta’s poverty, underdevelopment and economic corruption. During the course of his rise within various leadership circles, Sankara utilized these opportunities to organize the people for revolutionary change in order to defeat the dominance of the antiquated and outmoded system of neo-colonial governance. Sankara and his comrades instituted economic and social ideas which steered away from western dependency on the International Monetary Fund (IMF) and the World Bank, relying on enhanced use of Burkina Faso’s resources to construct educational institutions, hospitals, and state-directed projects aimed at improving the quality of life and the liberation of women. Not surprisingly, Sankara’s revolutionary ideology and practical programs gained tremendous support from both inside Burkina Faso and throughout Africa. Unfortunately, a myriad of opponents including dissident factions within his own political camp, as well as the military, finally moved to overthrow the national democratic revolution. Nonetheless, during the uprising of Oct. and Nov. 2014, thousands of youth and workers held banners and wore shirts with the image of Sankara. In the present social context of the upcoming elections, it is essential that a political program is developed which can win over the majority of working people, farmers and youth inside the country. A breakthrough in Burkina Faso towards a revolutionary vision of the future would have a profound impact on Africa and the international scene.